I finally saw “Hurt Locker” and only watched it because I heard it wasn’t your average Hollywood crap where soldiers, cops, and corporations are all evil (and if there are any good guys they are liberals). 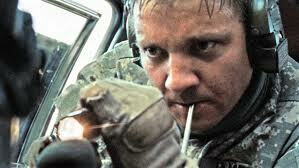 Excellent flick – I’m grateful for an incisive film about American warriors and the Iraq war. This entry was posted on December 11, 2010 at 8:26 pm and is filed under military, video, war with tags Afghanistan. You can follow any responses to this entry through the RSS 2.0 feed. You can leave a response, or trackback from your own site.